I made this particular batch as a light, spring-y dessert after a family dinner featuring rich, crusty lamb chops. I think it’s nice to end a substantial meal with something refreshing, although I confess I added a scoop of chocolate ice cream to my dad’s bowl because 1) he loves ice cream, and 2) chocolate + strawberries = NICE. 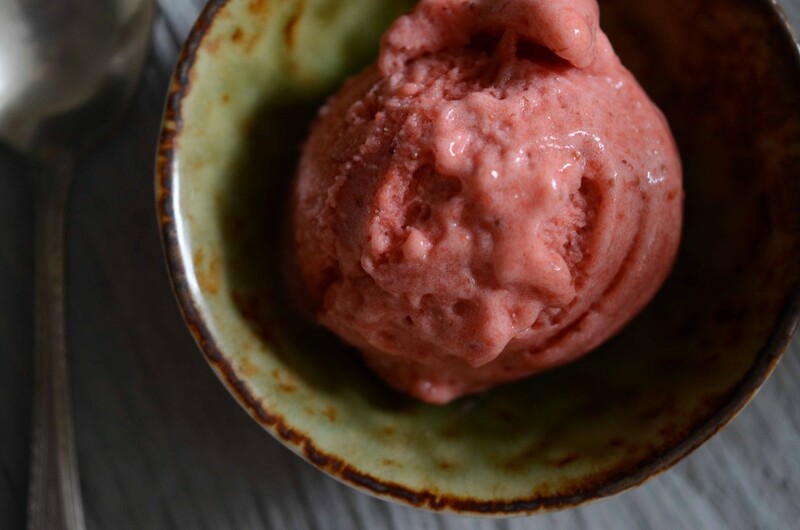 Roasting the strawberries and rhubarb concentrates their flavor, while a pinch of cardamom adds a hint of spicy warmth (although if you don’t like cardamom – it tends to fall into the love/hate camp – just skip it or substitute cinnamon). If you’re feeling adventurous, play around with fresh herbs (basil could be delicious), balsamic vinegar, a splash of booze, or even black pepper. 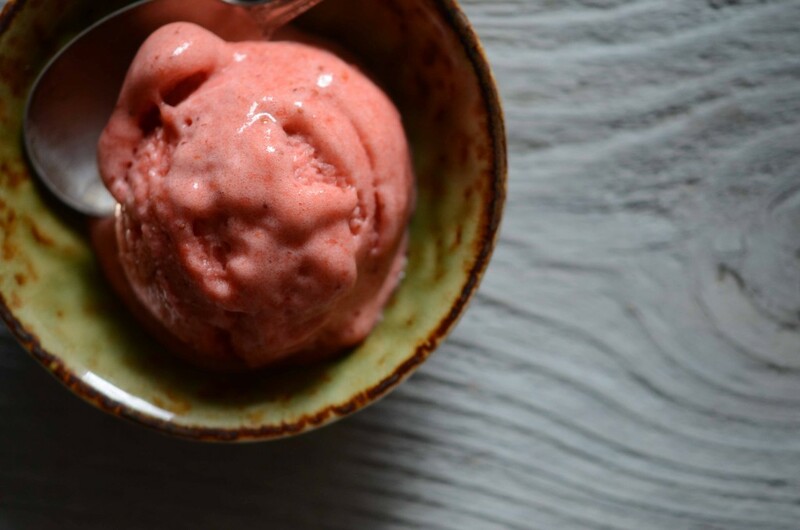 Sorbet is pretty forgiving so make it your own! 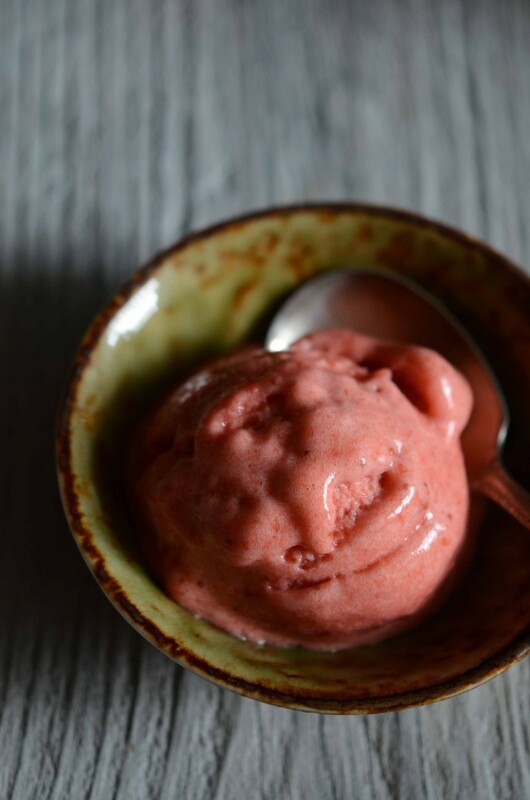 Along those lines, I intend to make a variety of fruit sorbets all summer long. It’s taken me awhile, but these days I like to think of dessert as yet another delicious opportunity to eat whole, nourishing food. Healing and feeling great is more of a treat than eating something that tastes good but makes me feel guilty or even worse, lousy. The great thing about not consuming grains, baked treats, candy, or alcohol is that fruit tastes like a gift from the gods. Seriously. You should see me eat a date – NC17, rarrr. I sort of liked fruit before, but only in the summer; in fact, I didn’t even really like dessert that much. Now I see and taste fruit for what it is – complex, juicy, sweet-tart, and very special. I don’t want to lose that appreciation which is why I don’t make a lot of paleofied baked treats – I know they’ll alter my palate in a way I no longer want. Which reminds me – I’ve had several people ask me if I think the autoimmune protocol (AIP) would be helpful for them. Good, real food is always good, but my gut tells me – gut pun, ha! – that if you’re not experiencing autoimmune disease symptoms (hypothyroid, joint pain, skin rashes, allergies, intestinal pain, headaches) but are experiencing health warning signs like weight gain, fatigue, sugar cravings, yeast infections, and suspected food sensitivities, I would not start with something as restrictive as the AIP and would absolutely recommend the Whole30 program, which is a one-month whole food (paleo) challenge. It does not restrict eggs, nuts, or nightshades but is a great way to see if gluten, dairy, sugar, alcohol, and/or legumes are causing health issues. I’ve had several friends not just drop pounds but reclaim their vibrancy, energy, clear skin, good sleep, and love for fresh, whole food in just a few weeks. The website is great and the book It Starts With Food is fantastic too (highly recommend). I tag my recipes Whole30 as well as AIP where appropriate so whether you’re looking for the occasional healthy meal or have immersed yourself for 30 days, 60 days, or more (like me), I’ll have lots of ideas and tips for you. Here’s to a summer of real food and good health! And oh, sorbet. 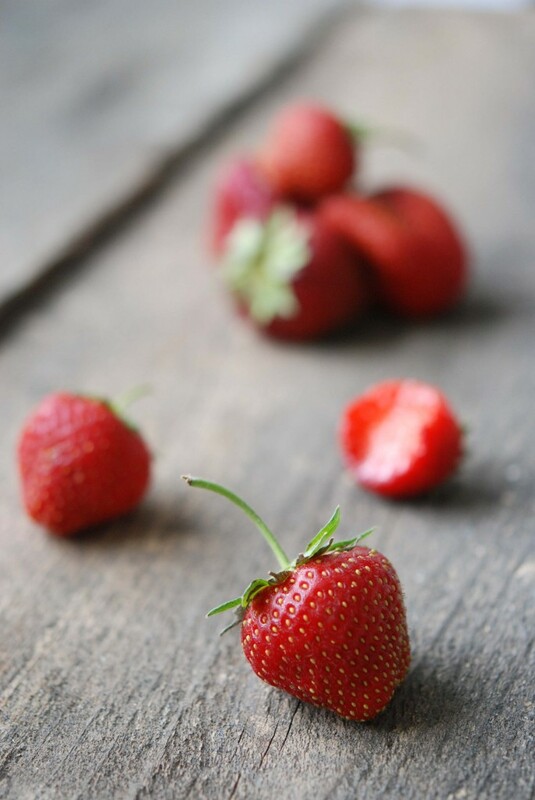 Place fruit – still in the blender – in the freezer for 30 minutes or until very cold. (Can be made one day ahead and refrigerated instead.) Process in ice cream maker according to package directions. Serve immediately or transfer to an airtight container and freeze. If frozen solid, allow to soften at room temperature for 10-15 minutes before serving.